Julio Mejia pulls plastic bags from the recycling steam at ecomaine in Portland in this April 17, 2013, file photo. Despite some towns in Maine dropping their recycling programs because of skyrocketing costs, a Maine island community is upgrading and streamlining its recycling process by offering single-sort recycling. Vinalhaven is the latest town in Maine to contract with ecomaine, a Portland-based recycling company. The town has been pursuing a new recycling program for the past two years and wanted a streamlined process at the transfer station that would encourage more residents to recycle, Town Manager Andrew Dorr said. Single-sort recycling allows for residents to collect all recyclable materials, and as is the case for Vinalhaven, bring them to the town’s transfer station without separating them by material type, such as paper, plastic or glass. The mixed recyclables are then brought to the ecomaine facility in Portland, where the materials are separated, according to Matt Grondin, ecomaine communications manager. Prior to using ecomaine, Vinalhaven residents and transfer station employees had to sort materials, before being loaded onto a truck that then needed to take an hourlong ferry ride to the mainland before arriving at a recycler in Rockport. “It was very time-consuming for the [transfer station] employees to have to handle it multiple times, and folks were looking to jump on that bandwagon and see a more streamlined process, one that might encourage more people to recycle,” Dorr said. 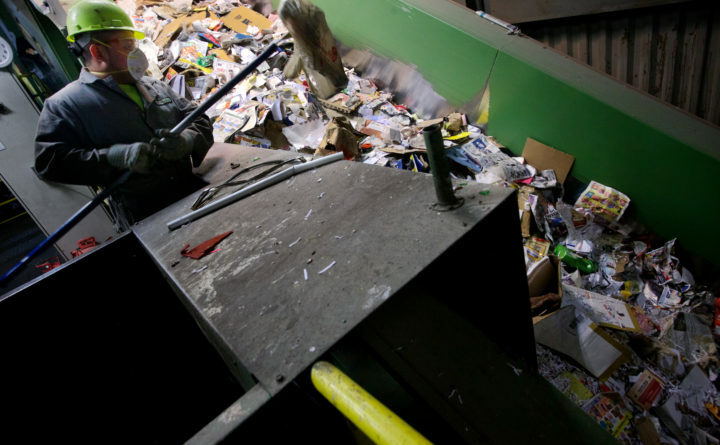 But improving recycling offerings hasn’t been the focus for some towns in Maine, whose officials say the rising costs of recycling are forcing them to suspend recycling programs. The rising costs are due in large part to tightened waste management practices in China, the world’s largest importer of solid waste. Grondin said ecomaine has remained relatively stable despite the downturn in the market. Paper is the commodity that’s been hit the hardest, but the price for other recyclable materials are “stable or up in some cases,” he said. Only one town, Etna, has dropped out of offering recycling through ecomaine since May, Grondin said, when the company cracked down on accepting contaminated recyclables. Increasing the recycling rate by streamlining the process with single-sort and adding a compactor at the transfer station to fit more recyclables in one truckload, are how the town hopes to achieve keeping costs low. Prior to having compacted truckloads, each trip on the ferry cost the town about $225, Dorr said, with 25 trips being made annually. With a smaller truckload, the cost per ferry trip is now $115, with fewer trips having to be made because of the compacted loads. “We have such high fixed costs to transport on the road and on the ferry, so we tried to find a more streamlined process for that,” Dorr said. With the downturn in the recycling market, Dorr said town officials are going to wait and see how their three-year contract with ecomaine goes and where the market turns, but for now, people on Vinalhaven are excited about the new streamlined process and the ability to recycle more products than they were before.